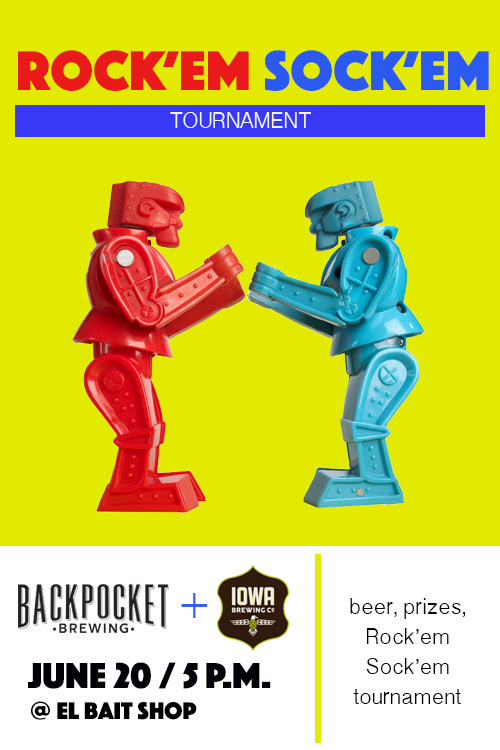 Join Backpocket Brewing and Iowa Brewing Company as they team up for a Rock Em’ Sock Em’ tournament at El Bait Shop in downtown Des Moines. Entry is free! Just show up and get ready to sock out the competition. Winners head home with Backpocket and Iowa Brewing merch. Need more reasons to enjoy a night celebrating Iowa’s craft beer scene? How about a chance to enjoy a tall cold class of the latest collaboration between these two Iowa breweries: Banana Cream Pie Hefeweizen. See you there!